Mellencamp wrote the thirteen songs included on the album during a thirteen-day span last spring. “I was tightly focused,” he related, “I got up every day and wrote and wrote and wrote.” The thirteen songs written by Mellencamp reflect various American traditions including blues, folk, western, gospel, rockabilly and country, and address such themes as the need for hope, the nature of relationship and narratives that recount extraordinary occurrences in everyday life. The recording locations were chosen based on cultural and music history, each providing a sense of place for the respective sessions. The First African Baptist Church is the first Black church in North America, dating to pre-revolutionary times. The original congregation and ministry were slaves; the church, in fact, provided sanctuary to runaways before emancipation. Mellencamp, who has a residence in the area, has long been familiar with the church and the role it played in the Savannah community. He and his wife Elaine were baptized there before the sessions commenced. While Sun Studios actually is a working recording facility, its equipment has been updated since the days of Elvis Presley, Carl Perkins, Johnny Cash and Jerry Lee Lewis, so Mellencamp’s team used the Ampex machine and established a makeshift recording booth in a construction shed in a vacant lot next door. Room 414 of the Gunter Hotel in San Antonio is where Robert Johnson first recorded for Brunswick Records in November, 1936. 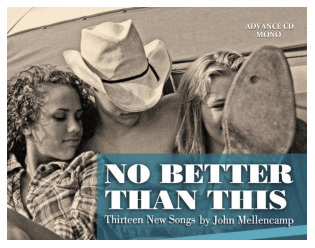 Mellencamp sang facing the corner of the room, just as Johnson had almost 74 years earlier.